Welcome to my studio at Zeh Original Art. 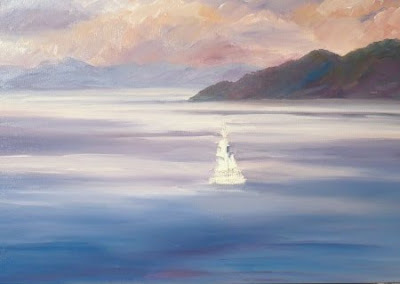 Today we will have a demonstration of an oil seascape painting on panel. 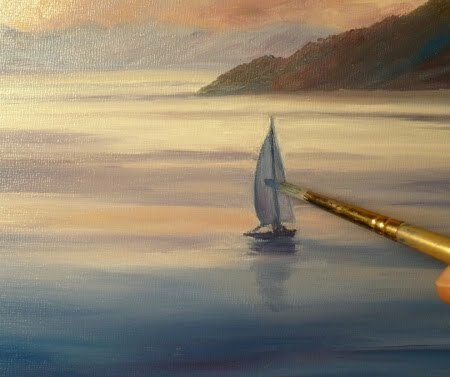 Painting water is one of my favorite things, whether it is the surf crashing onto the shore or a quiet harbor on a lake. If you are fortunate enough to live near the ocean or a lake or close enough to visit, you know the relaxing qualities of listening to the sounds of waves. Even if you don't, a painting can bring you there. 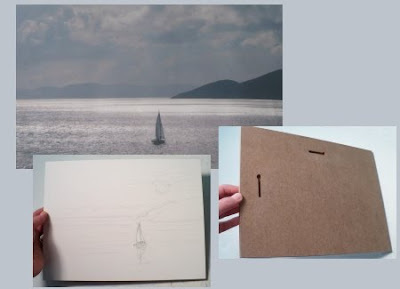 First I've assembled the materials: a photograph taken by a friend while she was vacationing in the Caribbean which I'll use as reference and a 9"x12" panel which has slots for hanging on the back so the owner can display without a frame if desired. You can see a light sketch I've made in pencil on the panel. I really like the relaxing qualities of this scene and have painted it once before with watercolor. That time, I kept the monochromatic tones of the photo using shades of violet-gray. This time, I'd like to add more color to the piece and a touch of sunset to the sky. The next step is to start painting. When painting landscapes and seascapes, I begin with the sky. It's from the sky that the light comes and the quality and colors of the scene will be determined by the type of sky on that day whether cloudy, rainy, evening, morning or midday and all the variations that a sky can have. 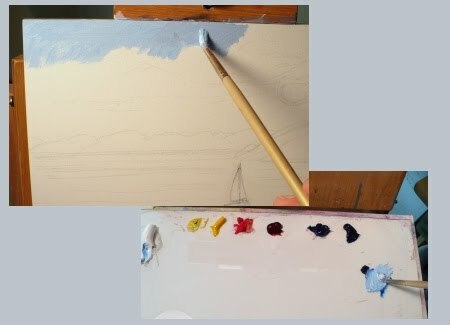 You can see that I've mixed a soft blue on my palette above and started to apply it to the sky area. 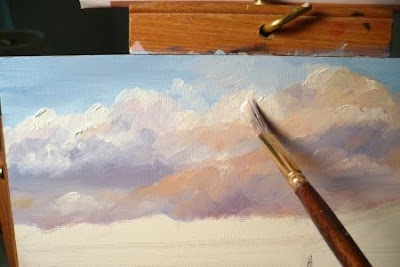 Painting clouds is fun! 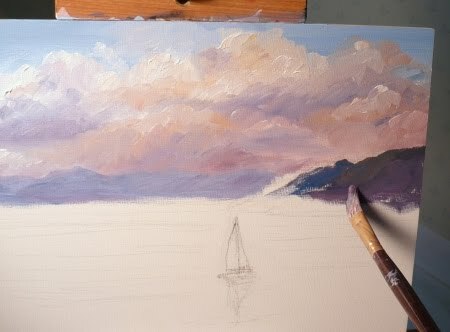 With these sunset clouds I can use thick application of colors. 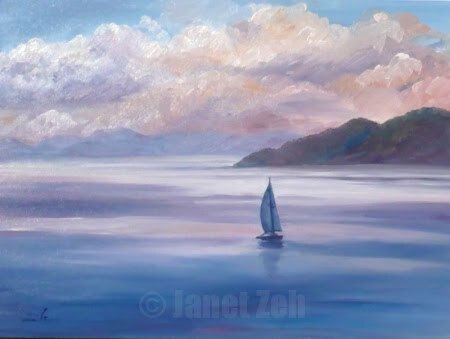 Since clouds are constantly changing, there is no end to the variations on what you can do with them in a painting! The best way to proceed is to continue from the top. I've painted the distant mountains a muted blue-violet shade and softened their edges to make them visually recede. Next the near hillside is painted in warmer colors since warm colors come forward. I mix colors right on the panel for this. You can see in the next photo the blues and magenta mixes that have occured. Pretty colorful for a dark hillside. However, I use only the reds, blues and yellows on my palette for the colors to keep everything consistent. Now the water. My goal is to maintain the feeling of the sun shining through the clouds and sparkling on the distant water. As the water comes closer and toward the bottom of the painting, it appears darker. This is because it reflects the sky above which is a deep blue though we don't see that in this piece. A little of the sunset colors of the clouds is reflected on the smooth ocean surface. All that is left now is the sailboat and its reflection. Though we know the sails are white, they are not painted bright white. We are seeing the shadow side of the boat silhouetted against the bright water behind it. This contrast is what makes the boat a focal point in this piece even as our eyes are drawn past the boat to the sunlit area beyond. The finished painting has a quiet mystery to it. The dark foreground and boat make a "threshold" over which our eyes can visually step into the sunlit areas. Perhaps you wonder what is on those distant hills or beyond the bend. Will the boat go there? You can take a journey with your imagination to find out! The original has been sold, but you can find the fine art print in my Etsy shop, Zehland.Etsy.com. You can see more Zeh Original Art painting demonstrations here. Once again, you've taken me into your world and given me a tranquil moment in the midst of a busy day. This is such a beautiful piece. Thanks for sharing the process with us. Thanks for the comment, Elaine. I'm glad to know my art can offer a tranquil moment. Life can be hectic and stressful so much of the time. Thanks, Net Raptor. Yes, it is a restful piece, isn't it? It's nice to do a seascape!